How was the Society for East Asian Anthropology founded? Invited to write my recollections, I sorted through old emails, reports, and papers, retrieving memories of the events and people that have meant much to me. As I type these recollections, however, I bear in mind that Individual narratives of past events are always flawed. They are not only the product of poor memory, they also reflect what Charlotte Linde (1993) called the “creation of coherence.” A narrator called to historical duty wants events to have meaning in some type of scheme. We also want to show causality and thus tend to ignore discontinuity or bits that are not easily reportable. And of course, once the events are told and retold over time they take on a life of their own. Perhaps SEAA should create a blog or site that allows comments. We could share other recollections, corrections, and asides, creating a history with scheme and disruption. We began as a section named East Asian Studies in Anthropology in 2001-2002. 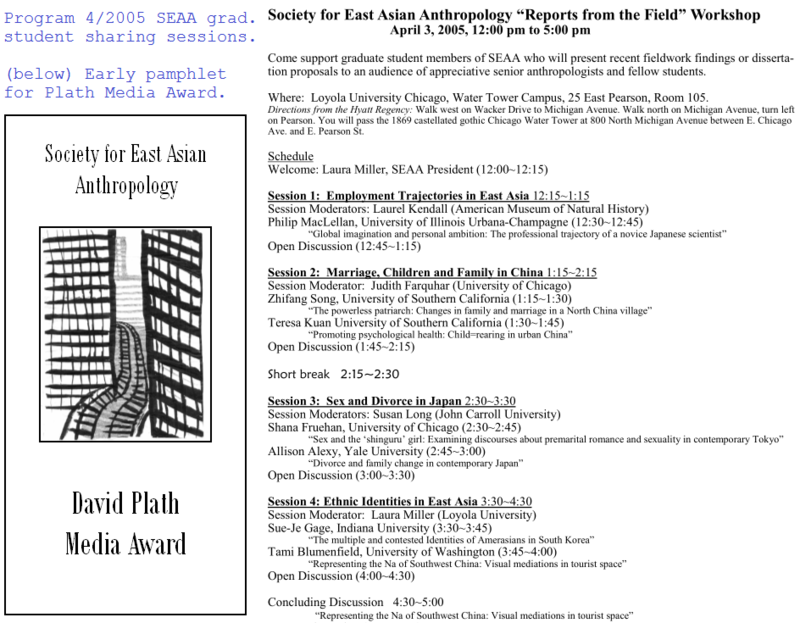 The current online EASIANTH archive only goes back to 2007, but the listserv is older. It was this listserv that enabled our efforts to form the section. Some of the debates and concerns we have as a section today were first expressed there. In 2004 the EASIANTH listserv had approximately 270 members. I hope others will contribute descriptions of the days during which we tried to get the section organized. Ted Bestor, who eventually became the first president, took the lead on this effort, first establishing the Interest Group and then tirelessly lobbying the AAA to allow us to move up on the scale to section status. He often tells the story of the AAA Executive Director who rejected our efforts by suggesting that the Association did not need a section with such a narrow focus. We owe our existence to Ted’s diplomacy and perseverance. I began my term as the second president early at the November 2003 AAA conference because Ted was unable to attend. In preparing the official AAA section report for the second year of our existence I noted that our membership as of October 2003 was 391, and that we had no expenditures from the 2003 budget. At the beginning, our official website was managed by a fellow named David Wiggins. I don’t think one of us ever met him, but he contributed essential labor to our group for many years. We were one of the few sections of the time with excellent graphics, links, member lists of publications, event listings, and other rich aspects. During these early years the ultimate Consigliere was Joe Bosco, who served as the first SEAA Treasurer. As a new section, he had to start from scratch, negotiating AAA’s mazelike apparatus. Our membership reached 454 in September 2004. In 2004 the Executive Board, seeking more attention for our members’ scholarship, established three Section prizes: the Hsu Book Prize, Bestor Student Paper Prize, and Plath Media Award. When David Plath learned that the media award was to be named after him, he wrote to me: “You have given me something to really be thankful for. My ancestors thank you, my descendants thank you, and I thank you. It’s pure joy.” Plath sent me one of his drawings which I used for the first advertising for the prize. Mentoring graduate students in the field was one of our earliest missions. In Spring 2005, I implemented, planned and hosted the first graduate student workshop, “Reports from the Field.” It was held in Chicago during the time the Association for Asian Studies annual meeting took place. It was intended to be a one-day informal, non-registration workshop where graduate students would present their recent fieldwork findings or dissertation proposals. Senior scholars Laurel Kendall, Judith Farquhar, and Susan Long joined me at the workshop (see program, click image for full view). I arranged free space and refreshments at no cost to SEAA through the downtown campus of Loyola University Chicago. Most of us who participated thought it was a success and offered graduate students some specialized mentoring. Another mission identified early on in SEAA was making headway in the digital arena. This led to an event held in conjunction with the AAA Annual Meeting in 2005, a Digital Materials Workshop for faculty and students on using digital resources, led by two CJK (Chinese Japanese Korean) librarians. It was free for all SEAA members. Co-organizing this workshop with Victoria Bestor took considerable time, but I believed the effort worthwhile. Naturally, there were many glitches and disagreements in the early years. Judges for prizes agreed to evaluate submissions yet failed to do so, and people forgot to reserve rooms for meetings or to order the cash bar (so important!). At the AAA annual meeting in Chicago in 2003, we voted to change the name of the section from East Asian Studies in Anthropology to Society for East Asian Anthropology. This decision was not universally welcome despite the majority vote. I recall that at the initial Interest Group meeting held in 2002 we discussed the possibility of widening the focus to include scholars working in Southeast Asia. This idea fell through because of lack of interest on the part of those scholars. In addition, during the early years of the section, many prominent scholars of East Asia distanced themselves from us, wanting to prioritize identities as “theory” scholars and not wanting to associate with a Cold War area studies construct. But those of us who worked to create this section knew that for most academics, East Asian studies was a necessary institutional category on our campuses. And in the AAA it was the best method to allow otherwise marginal scholars to participate on the program. A major turning point occurred in 2004 when we needed to focus on our own constituents at the expense of supporting the AAA. In 2004, the San Francesco Hilton Hotel, slated to host the AAA that year, locked out its workers in a labor contract dispute. On October 21, 2004, in solidarity with the hotel workers, the AAA Executive Board voted to move the 2004 Annual Meeting from San Francisco in November to Atlanta in December, a change in both venue and date. While this shift posed an inconvenience for most members, it was catastrophic for SEAA members living in East Asia. I received many panicked emails: “I have a non-refundable ticket!” and “My university doesn’t allow such sudden changes in date and location!” In thinking about how to help them, I thought that if I could find a school in the Bay Area where people could present their papers, we could perhaps salvage the situation. As president, I made the decision to quickly organize a conference in less than a month, a decision unanimously endorsed by the SEAA Executive Board. We held our first SEAA conference on the campus of the University of California, Berkeley from November 18 to November 20, 2004. The conference was a stunning success. I am still impressed when I recall the vibrant presentations, activities, and generous contributions. SEAA Berkeley featured 10 panels, 52 papers, 3 film screenings, business meetings, and other events such as a wine reception at a gallery of Asian art. Everyone pitched in once we were gathered in the Bay Area, but a few people stand out in my memory. Daisy Rockwell, who was then Associate Director of the Institute for South Asia Studies, reserved most of the rooms on campus for us. For the wine reception, Shannon May (then a graduate student at Berkeley) drove me to COSCO to buy the wine and cheese and then delivered it to the gallery. Additionally, the University of California Press (thanks to Reed Malcom) kindly provided the funds for a wine and cheese reception after our Business Meeting held at the Center for Japanese Studies (See photos of the reception). Although I received condemnation from some colleagues for not going to Atlanta in support of the AAA, I believe I did the right thing for SEAA members. Our first conference was not held in place of or in opposition to the AAA meeting. Rather, we weighed the options and came up with the best solution for our section. We were mindful of the unique difficulties faced by our colleagues in Asia. This event was pivotal for us because we created an identity that was separate from the AAA. It was so successful that we decided to do it again. Gordon Mathews stepped up to organize the second SEAA conference in Hong Kong in July 2006, an event that truly upgraded our profile and sense of cohesion. Charlotte Linde, Life Stories: The Creation of Coherence (Oxford University Press,1993).